A TEMPORARY holding center may soon accommodate children in conflict with the law (CICL) from towns in the second district of Cebu Province. Located in the southern town of Dalaguete, the facility will also cater to CICL from the neighboring towns of Alcoy, Argao, Boljoon, Oslob, Samboan and Santander. A groundbreaking ceremony for the P685,000 facility led by Gov. Hilario Davide III and Vice Gov. Agnes Magpale was held last Tuesday, March 19. The Capitol wants to put at least one holding center for CICL in all of the seven districts in the province. The center has no limit as to how many CICL it will accommodate since it’s just a temporary holding area while concerned agencies process their documents. The Municipality of Dalaguete will oversee the operation of the facility. In an interview last Monday, March 18, Magpale, chairperson of the Provincial Council for the Welfare of Children, said there is a need to establish more CICL facilities not only in the province, but also in highly urbanized cities. 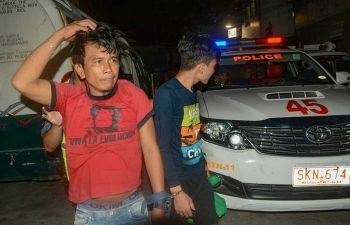 Her pronouncement came after a 17-year-old boy was charged with murder after the evidence gathered by the National Bureau of Investigation 7 pointed to him as the prime suspect in the murder of 16-year-old Christine Lee Silawan. “What I really want most is to build more CICL facilities in every big city like Lapu-Lapu and Toledo. Ours here in the Province, the one in Consolacion, can only accommodate 33, and that’s for the 11- to 14-year-olds,” Magpale said. In 2015, the Justice Peace and Integrity of Creation–Integrated Development Center Inc. turned over a center for CICL in the northern town of Consolacion to the Province. The facility, called My Home, houses CICL between the ages of 10 and 15 years old. It currently caters to 26 CICL. A P10-million facility for CICL is also set to rise in a Provincial Capitol-owned lot in Barangay Inayagan, City of Naga. A groundbreaking ceremony for the two-story Bahay Pag-asa Center was held last Feb. 21.